We’ve hit the road and are officially ‘caravaners’ on a South African road trip! We left Howick heading for Kimberley thinking we would get there that day including a stop off in Clarens for me to see a town I have heard a lot about. 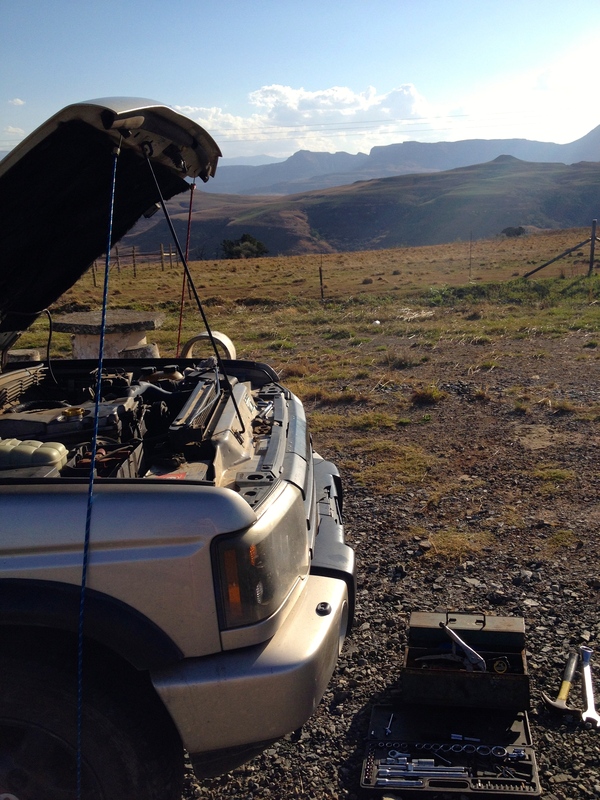 However, hadn’t really taken into account the difference in driving speed when towing a VERY full caravan as well as the fact we would need to stop at the top of a mountain to change a water hose in the engine. Needless to say that wasn’t as straightforward as it could have been; surrounded by howling winds with the caravan roof lifting and the back window blowing out led to a few ‘choice’ words and us questioning what we are actually doing. On the ex-Mayor’s recommendation we spent the following day in the city rather than driving straight through. We were told that no matter how well behaved the dogs may be, they couldn’t go up to Naval Point. A seven point turn with the caravan, around the security booth, later, we abandoned the caravan with the dogs to guard it, and headed up the hill. From here we looked out over what is known as a University city, alongside a larger than life statue of Mandela.